This recipe might just be the healthiest on my site. The combination of ingredients have been tweaked over the years to maximize the health imparting benefits. However, I can’t take credit for this formula. A kind gentleman by the name of Raul was gracious enough to gift it to me. Raul is a chemistry professor at the National University of Mexico who has investigated turmeric for over 10 year. It’s safe to assume he knows more about turmeric than most people. Raul shared this recipe with me so that more people can benefit from it. We both enjoy sharing and spreading information people can use to improve their health. Why is this smoothie so special? Let’s start with the key ingredient, turmeric. Inflammation is the root cause of myriad diseases and health issues. Turmeric is one of the most powerful anti-inflammatories found in nature. It was discovered that turmeric can stop inflammation at a biochemical route level. Meaning it addresses inflammation where it originates. It also prevents the deposition of amyloid plaque in the brain, which is what causes Alzheimer’s disease. Raul’s mother began consuming this smoothie after being diagnosed with Alzheimer’s. Within 6 months her overall state improved significantly. She also suffered from bad arthritis and those symptoms decreased considerably. She’s now no longer in pain. There are many other testimonials from arthritis suffers who have benefited from the anti-inflammatory properties of turmeric. The rest of the ingredients in this recipe are no slouch. A new one for me are bilberries. I’ve heard of them, but never tried them. I haven’t found a good source of fresh or frozen bilberries here in Michigan. If someone knows of one please leave a comment below. I substituted my favorite local berry, blueberry. It is not advised to use milk in this smoothie. Excess sugar in bilberries can be removed by soaking them 5 minutes in water and filtering them prior to blending. Enjoy! Raul and I would love to know if you try this ultimate turmeric smoothie – please leave a comment below. Happy Blending! This smoothie was fantastic! I changed it a little bit and added one cup of mango instead of 1/2 cup. I used the coconut milk. I also added 2 cups of spinach to add my greens. I’m really impressed with it. Thank you! Great to hear you enjoyed the smoothie and modified it to meet your preferences. I also wanted to add to my comment above that I read the article on fats. I found it extremely informative and shared it with my sisters. It changed my outlook and my diet. I absolutely love this smoothie. I will go so far as to say I’m addicted. I did add chia gel and ground flax and this last time I added 1/2 cup of fresh pineapple instead of the apple. Fantastic, Sheritta! Sounds like a healthy addiction to me :) Chia seed gel, ground flax, and fresh pineapple are excellent add-ons. I have some questions about this smoothie: How many times a day shoud I take this? The protein is added to the smoothie? How much protein is needed? I would consume this once a day, preferably for breakfast. You don’t have to add additional protein, but if you do, add one serving of whatever protein powder you prefer. Whey protein is recommended. I’ve been trying protein that come in a small envelope and one serving is the whole envelope. Is your serving something less, like one tablespoon? Hey Ryan, I use this smoothie after I work out. I add pineapple and mango with all the ingredients and I love the taste of the turmeric, it is really nice. Excellent, Peter! Mango and pineapple are great add-ons. The turmeric helps reduce any inflammation from your work out. Hi! Just found you the other day and tried the Go to Sleep Smoothie, and Yum! And I slept well, too. Anyway, wondering about drug interactions with turmeric-any dangers known? Great to hear you enjoyed the sweet dreams smoothie and slept well! I’m not aware of any drug interactions with turmeric. If there’s a drug(s) you’re concerned about I’d consult your doctor or a licensed medical professional. I like fresh turmeric … how much would you recommend I use in this smoothie? Thank you for the information on how great turmeric is. Fresh turmeric is wonderful. Either grate or cut into small pieces about 1 teaspoon of turmeric and work your way up to 1 tablespoon or more depending on your taste preferences and tolerance. Would this ultimate smoothie be as valuable using fresh turmeric? I have fresh and prefer to powdered but want best possible anti inflammatory result as being tested for rheumatoid arthritis. 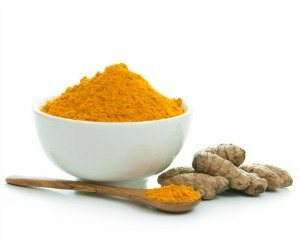 How much fresh turmeric would I substitute for powdered? Fresh turmeric is just as good as the dried spice. I would start with about a 1 inch section of fresh turmeric, thinly sliced, and work up to a couple inches if the taste is still palatable. What about using the contents of a bilberry capsule. I have not been able to source fresh or frozen here in FL. Any recommendations for a good site that describes bilberry without sales puffery? I picked up some Bilberry at the local pharmacy but wasn’t really sure how much to use. Plus, I have no idea if what the label says is accurate. I’d really like to be able to source some fresh ones just to see how they taste. Are they like a blueberry? I believe they are both in the same Genus. Anyhow, I did try the Ultimate Tumeric Smoothie today and I’m still standing….lol. Again, until I get my tumeric root I ordered, I used some capsules. I also used MCT oil in lieu of the other oils suggested. Tasted fine although a little on the bland side. But if it helps my health, I’ll drink them by the gallon. How often should I be using this smoothie? I have many other I like as well but want to make sure I get the benefits of this one. Maybe I can add the tumeric to other smoothies? Thanks for posting this interesting recipe. Bilberries are very similar to blueberries. If you travel to the northern tip of the upper peninsula of Michigan (Copper Harbor) in August you’ll find them in abundance. This is the only place I’ve found fresh bilberries. Go ahead and substitute blueberries in this recipe. Good to hear you’re still standing :) Play with the ingredients and try using a little more sweet fruit to improve the taste. You could have this smoothie every day. For variety and to incorporate more ingredients into my smoothies I typically have 3 or 4 that I make on a regular basis. Yes, you can add turmeric to any other smoothie. Living in FL I don’t think I’ll be able to get back there, but I will use the blueberries as you suggest. Anxiously awaiting the arrival of some tumeric root I ordered so I know I’m getting the “real goods”….. I have never totally trusted the nutraceutical (sp?) industry do good diligence in terms of claimed amounts of whatever supplement you may want to look at. I will most likely mix it up with the smoothies but I am trending to greener smoothies to get the sugars down. Drives me crazy when I keep finding sugar hiding everywhere I look!! I’m feeling better, hopefully looking better, and sleeping better since I started adding smoothies to my lifestyle. I’ve backed off supplements in recent years and stick to whole foods whenever possible. You can find turmeric root at Whole Foods or a similar store. Amazing how much sugar lurks in food products these days, another reason to stick to whole foods. Good to have you aboard the healthy smoothie train, Matt! May all your future smoothies be nutritious and delicious. I now have turmeric root (thanks, Amazon) and there is a very noticeable difference between it and the capsules. I noticed NOTHING taking the capsules but with the root, my hip has improved greatly in a matter of weeks. The fact I notice such a difference now concerns me about other supplements I take. Are we being scammed by the nutraceutical (sp?) industry? I am thinking about the settlement GNC made with I believe NY over “truth in labeling issues. Back to the turmeric…. the fresh root does impart a rather pleasant, earthy flavor to my smoothies. If I use too much it can overwhelm the other more subtle flavors. It is difficult to quantify how much curcumin (active ingredient?) I’m getting because the roots are by no means uniform….lol. I usually cut ~1 – 1.5” pieces, scrub thoroughly with a vegetable brush under cold running water and throw it in the blender, skin and all. In the early years of my health journey I tried and consumed a number of supplements. Almost every health guru was promoting something that you had to have. Some with good intentions, others just looking to make money. What I’ve arrived at (with the help and wisdom of my girlfriend) is that whole foods are the best option. Nature knows best. Isolating active ingredients from say turmeric into a pill pales in comparison to the real thing. The only “supplements” I consume now are herbal extracts, teas, and powders. There are some very good and valuable supplements on the market that many people have benefited from, but my personal experience has led me to whole foods that contain a variety of nutrients in a balance designed by nature. Thanks for sharing your experience with turmeric. Great to hear your hip is doing better! I agree wholeheartedly with your comments. Years ago I worked with a physician and we sold supplements — in such volume at one time that I was able to have “custom bottled” vitamins made under our own label. They were for chelation patients and I always insisted on a COA with each lot ordered. Now I realize how worthless that piece of paper was. I do take glucosamine HCL with MSM for my hip, but recently changed brands. Once again, to my amazement, I noticed a difference after switching. If you do buy supplements, you have to shop carefully and check out the vendor in depth. Sort of funny that the brand that is working is the Costco store brand, but it does work. I also give it to both of my hounds and the one with a bum hip is definitely more active and now wants to chase the ball all the time…. fantastic. I appreciate your comments and continue to enjoy reading on your site. You are doing a bang up job!!! I agree with your comments for sure nothing is better than consuming the proper foods in the raw as a part of your daily diet. Working in the supplement industry I can also agree that most are crap as it’s impossible to product a good supplement as cheap as many are selling for which means fillers are common. On the other hand you also have to be careful when you pay for a better supplement you can’t simply assume it’s better, there are very savvy profiteers out there who are very good at branding who sell a bad product for a premium price and this is especially true on amazon unfortunately because of how easily reviews can be bought and listings can be optimized. I appreciate your insight and couldn’t agree more, Shawn. Unfortunately, the onus and work is on the consumer to thoroughly evaluate supplements. Thought I’d get on the band wagon here and comment on my second go around with this smoothie. Honestly, I think it’s one of your best ones yet and wish to thank your supporting friend Raul. Instead of bilberries (because I don’t know where to find them here in Calgary, AB) I used 1/4 cup dried whole golden berries (a superfood). I loved your addition of hazelnut oil and I also used about an inch of whole turmeric… sure leaves an awful yellow stain on your hands, so I use gloves now! For protein I added hemp seeds. For the liquid, I used yarrow tea (cold), which is an anti-inflammatory and promotes blood circulation. At the end, I added a few superfood powders that help in some areas: womens’ hormonal issues (maca), regularity (triphala), ashwagandha (here’s a good website that lists the benefits of this superfood: http://herbwisdom.com/herb-ashwagandha.html), a bit of fruity sea vegetables, and lastly a touch of bee pollen. Thanks for all that you’re doing to promote healthy smoothies. I love your site! Thanks for stopping by and leaving such a nice comment. Myself and other readers who can benefit from the info appreciate it. Bilberries are hard to come by. Golden berries (one of my favorites) is a great substitute. Yes, must be careful with turmeric staining your hands, and lips when munching on whole root. Yarrow tea, very nice. I use yarrow tincture to keep the mosquitoes away. You’re definitely on top of your smoothie game with all the superfood powders. I’ve included ashwagandha in a couple recipes and will be mentioning it in an upcoming article on anxiety. You’re welcome from Raul and I. If you didn’t drink this all at once, how long would it last in the refrigerator? It will last for around 6-8 hours refrigerated, Kristi. Thanks for the tip, Amina. Yes, you can use powdered turmeric spice that you would purchase at the grocery store (opt for organic). Yes, you could substitute ginger juice for ginger root. Hopefully this smoothie brings you some relief, Wendy. You’re welcome, Wendy :) I reply to 99% of the comments/questions on my blog. I forgot to mention something in previous comment. Born an raised in WhiteLake on Oxbow Lake. Question Ryan; Is there still bear watching at the dump in Copper Harbor? I am not sure if you would know, worth the effort. Nothing compares to the Michigan coastline in the summer! I’ve only been to Copper Harbor once (2014) and can’t say I saw any bear watching at the dump. Michigan is one beautiful state! but it’s so high in cabs and sugar. What can I do to bring these two down and still be tasty? You can use 1/2 an apple or omit the banana to reduce sugar and carbs, Francesca. When you say “Soaked Oats” does that simply mean to put 1/2 cup oats into water and leave to soak either overnight or a few minutes ok and not cooked? Just put in the smoothie mix. – Soak 1 cup rolled oats in 1 cup water and 2 tablespoons acid (lemon juice, liquid whey, apple cider vinegar, or yogurt) for about 8 hours. Soaking overnight is very convenient. – Add another cup of water and 1/2 teaspoon sea salt to soaked oats, stir, heat to a low simmer, and cook for 5 to 10 minutes. – Consume with liberal amounts of butter and cream. Or toss into your next smoothie and take your oatmeal to a new level of flavor and nutrition. HI,I JUST COPIED DOWN YOUR ULTIMATE TURMERIC SMOOTHIE RECIPE INCLUDING THE ADD ONS.I AM GOING TO MAKE THIS SMOOTHIE IN MY MAGIC BULLET BLENDER ASAP WHEN I GO SHOPPING FOR THE INGREDIENTS AT THE GROCERY STORE. FINALLY I HAVE FOUND A SMOOTHIE RECIPE THAT WILL TAKE CARE OF AND GIVE ME RELIEF FROM MY ARTHRITIS SYMPTOMS AND CHRONIC PAIN.I WILL LET YOU KNOW HOW THIS SMOOTHIE EASES MY PAIN.BUT I WILL HAVE TO USE HALF A SMALL APPLE CUT UP AND PUT IN THE BLENDER WITH THE OTHER INGREDIENTS.I HOPE THAT ALL OF THE INGREDIENTS WILL FIT IN MY BLENDER. I think you’ll really like this smoothie, Kim. Let me know how it turns out. Hey Ryan, Iove this article thanks for sharing. I am looking at starting a new diet to reduce my inflammation. I keep reading reviews about Turmeric with BioPerine supplement but can’t make up my mind because of the price. I understand it has a ton of benefits which I can kind of justify for the price but then again in this review https://www.totalbeings.com/science-natural-supplements-turmeric-with-bioperine-review/, they are saying it is great. Would love to get your opinion on it and is it something someone needs when first starting out. Thanks again for the tips. I’m on the fence if I should buy it or not.